Sing a song of flowers, flowers all around. Flowers of each color make a pretty view. And blue and purple, too. We went to the butterfly house at the zoo this past weekend. Oh my! Such beautiful butterflies. We had fun standing still and watching them flutter around us. We each held out a finger silently hoping a butterfly would land on one of us. Our favorite part of the butterfly house is looking through the window and seeing the caterpillar to butterfly process. All the cocoons of different sizes hung in rows; the newly emerged butterflies trying wings for the first time. 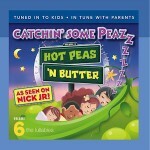 The process of caterpillar to butterfly is a great spring theme for toddlers and preschoolers. Spring brings so many changes to the world around our little ones. Butterflies are just one beautiful example of how spring transforms something plain into something colorful. 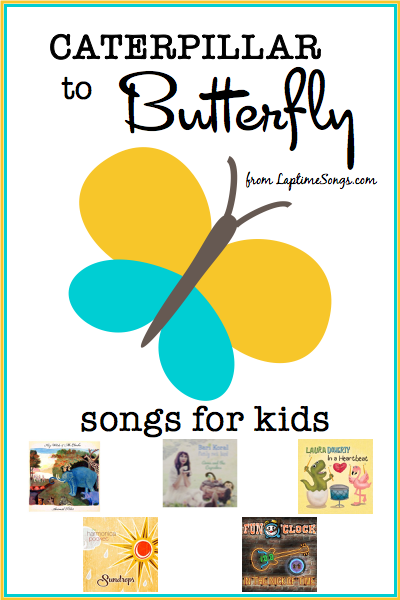 I love this list of songs because they all teach the caterpillar to butterfly cycle. 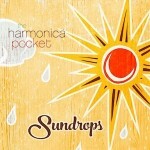 Each song captures the beauty of this process in a unique way. 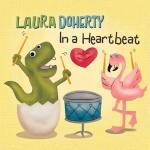 These songs are a great way to reinforce the concepts taught in books, poems or activities. 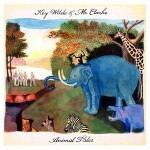 They would make a great soundtrack for a crafting session, a butterfly hunt, or free play time. 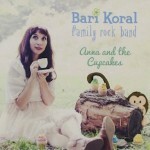 They can also take front stage by letting kids explore instruments while listening. Butterflies begin as an egg. When the egg hatches, a caterpillar emerges. The caterpillar grows, eating leaves. Then the caterpillar spins itself into a cocoon. Inside the cocoon, the caterpillar transforms into a butterfly. Once the transformation is complete, the butterfly breaks out of the cocoon. At first the butterfly’s wings are still damp. The butterfly cannot fly until the wings have dried off. Once the wings have dried, the caterpillar to butterfly transformation is complete and the butterfly takes to the sky. 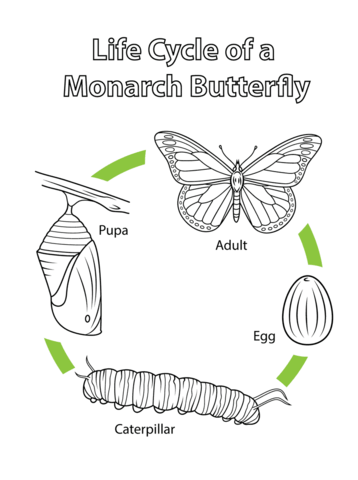 Find this and more caterpillar to butterfly coloring pages at Super Coloring. Butterfly, butterfly, reach the sky. This old adage has always had special meaning for me. My mom’s birthday is in April and my birthday is in May. I imagined this phrase was coined just for me that my mom, represented by April showers, brought me, represented by May flowers, into the world. Such is the innocence and simple understanding of a young child. It is probably also the main reason why I love April showers so much. Rain, storms, thunder and lightning have always filled me with awe and appreciation for nature. 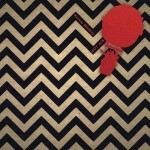 I love the sound of rain dripping, dropping and tapping on my windows and roof. 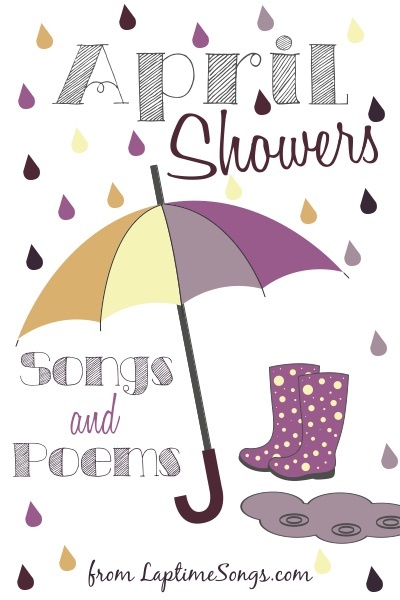 So it’s no surprise that I’ve amassed quite a list of songs and poems about April showers. I’m excited to share this treasured collection with you today. I hope it will help in filling out your storytime program centered on your favorite book about rain. Side note: my all-time favorite book to read aloud about rain is Listen to the Rain by Bill Martin Jr and John Archambault. Just click on the title of the poem and you’ll be taken to the page with the full lyrics. 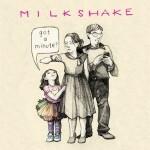 Rainy Day Dance Party by Milkshake on the album Got a Minute? Spring is bursting with new energy. I can feel it, and I can see my little ones are feeling it, too. We all get a little restless during spring. After months of cold winter stillness, spring is a time to get active. 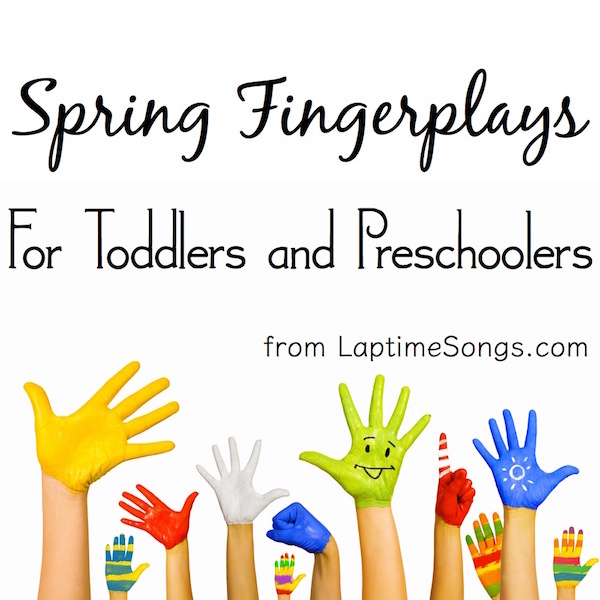 These five spring fingerplays will help busy hands connect with spring. All around our neighborhood we are watching bunnies, squirrels and birds come out of their winter hiding. 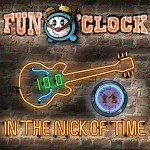 I picked fingerplays that match and will build on the experiences of little ones. 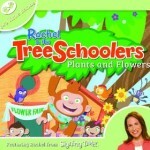 A spring nature walk or scavenger hunt would be a great activity to introduce these spring fingerplays. As little ones learn these spring fingerplays and songs, they are building emergent literacy skills. Learning rhyming sounds and rhythm from these fingerplays helps build phonological awareness. We can also build vocabulary by using new words within a familiar context; for example, 5 Little Bunnies includes the words “hop” “grass “lawn.” Children develop a deeper understanding of words when they can place them in context and associate them with other words. Create a pond: Lay a blue blanket down and have little ones jump onto it pretending it is the pond that the speckled frogs jump into. 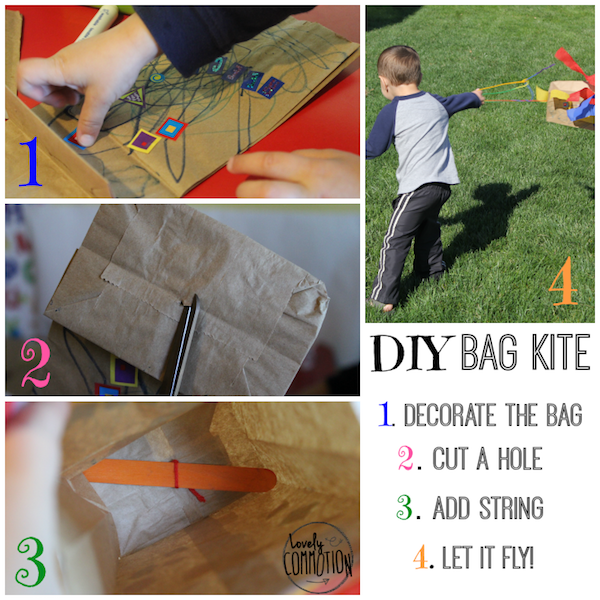 Make a kite: These lunch sack kites are easy to make for little fingers and use common materials. Check out Lovely Commotion for the full list of materials and her tutorial. 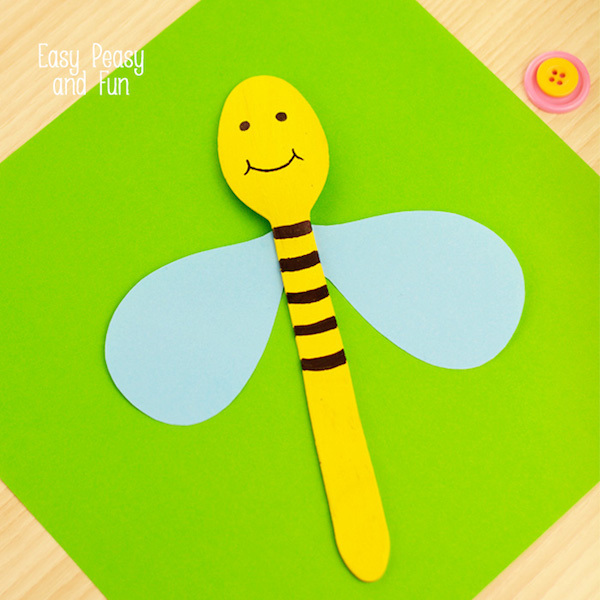 Wooden Spoon Bee Craft: This bee craft is so simple and darling. Find the full tutorial on Easy Peasy and Fun.